I knew there must have been some benefits to Gordon Brown as Prime Minister! 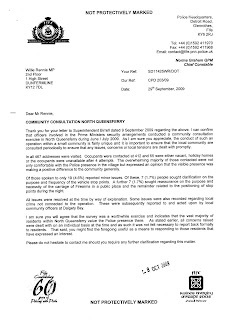 I received this letter from Fife Police regarding the survey of residents that they conducted which shows that residents believe that crime has dropped in the village thanks to extra police presence to protect the Prime Minister. Even though crime levels were not very high before most North Queensferry residents appear to feel safer thanks to the PM. I'm glad there is at least one benefit to having Gordon Brown as Prime Minister! So many people can't wait to see the back of him. There are clearly some concerns about the vehicle stop points and the carrying of guns which the police are conscious of. It's helpful that the police undertook this listening initiative. It shows they are sensitive to local opinion. Pupils from Camdean Primary School in Rosyth visited Westminster on Tuesday as part of a week long visit to the city. They enjoyed an official tour of the Palace followed by a talk from the education department and finally from me. Afterward they went for a whistle stop tour of the central London. The following information is intended to provide a brief synopsis of the progress to date on the construction of the new Carnegie Primary School in the east of Dunfermline. "All members of the Fife Council team working on the project are cognisant of the challenging timescale to open the school for the new academic term August 2011. The new Carnegie Primary school is being procured and will be constructed by a contractor appointed under a traditional single stage design and build contract. 31 'expression of interests' were received. Of the 31 submissions, a preferred shortlist of 5 contractors was reached with formal tender invited in July 2009. Over the past 3 months, design work has been undertaken by the contractors, responding to the Council's tender document, brief and vision for the new school. Of the 5 shortlisted contractors only 4 decided to submitted formal tender returns on 23 October 2009. The Fife Council team are currently evaluating these detailed tender documents, with a recommendation of the preferred contractor to be made to the Building Fife Future Project Board in December 2009/January 2010. Upon selection of the preferred contractor, detailed design for the school will commence. Work to construct the school is programmed to start in May 2010. 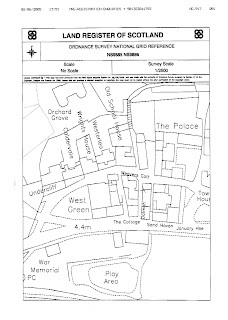 At this present time the Fife Council's Education and Property Services team are satisfied that the project is on programme to be completed by end of July 2011 and open for the new academic term August 2011." 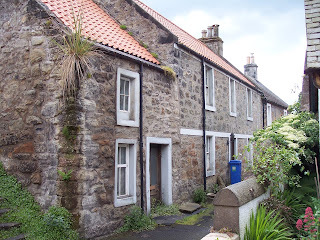 I'm on the hunt for the owner of an abandoned home in the centre of the historic village of Culross. The issue of ownership was raised with me by neighbours who were concerned about the condition of the home. However, investigations at the Land Registry revealed no clues as to ownership. Now I'm appealing to you to help with the hunt. Families throughout West Fife are desperate for a home so to leave this one empty is a calamity. The eighteenth century two storey stone built terraced house is an integral part of the historic village. It’s a lively community and to add another family to that life would be fitting. Do you know who owns this house? "If the management and board of the Society were so reckless why didn't the FSA identify this and act?" Instead they duck and dodge, providing lots of noise and detail but no clarity. I think the Scottish Affairs Select Committee should send the Government's response back and tell them to try again. As a child I was fascinated by treasure and discovery, frequently undertaking quests in the countryside. 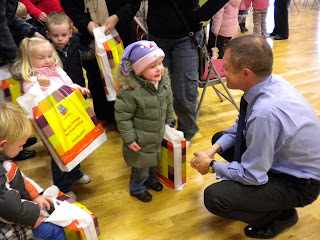 Well recently I had the opportunity to hand out some treasure to nursery children in the form of book chests. Fife Council's Bookstart scheme aims to entice young children into the habit of reading. Entertained by Aiken Drum at Inverkeithing's Civic Centre children from Inverkeithing, Aberdour and Beanstalk nurseries the children each received a selection of books in their own special treasure chest. A bustling, vibrant playgroup at Pitreavie Playing Fields was my visit this morning. Led by parents this chairity received a glowing report from the inspectors. Today I joined the South Fife puppy walkers for a Coffee Morning in Crossford Scout Hall. There were lots of puppies and working guide dogs...waiting to meet me! Rosyth to become 'nuclear graveyard' - UK, News - The Independent: "Mr Brown said: 'We will not allow the Rosyth area to be frozen by nuclear dumping or becoming a nuclear graveyard. The Government proposals cannot be allowed to go ahead.'" This is not a report from today, but fifteen years ago - twelve of which Labour have been in charge! It's about time the Prime Minister used his power to remove these seven nuclear submarines from Rosyth Dockyard. I was delighted to be asked to open the new Talk Matters premises at Dickson House in Elgin Street, Dunfermline a couple of weeks ago. Talk Matters is a confidential counselling service available for people in Fife with a wide range of problems including anxiety, anger, stress, depression or bereavement. Following news that the RNID criticised the Edinburgh Festival Fringe for their lack of facilities for deaf customers, I was invited to meet CLAUDE Clear Audio Systems. The Fife company provides advice and supplies the full spectrum of audio equipment so that the 15% of the population that have hearing difficulties are not excluded. The company made contact with me after I kicked off a campaign to improve the service offered by call centres to their deaf customers. I'll now be contacting the Edinburgh Festival Fringe to get the two together. Yesterday I had the pleasure of discussing politics and the challenges of the world with a vibrant and intelligent group of young people. Primary Six and Seven at North Queensferry Primary School refreshingly engaged. The pupils had been learning about how Westminster works and had ran their own election with imaginative policies and eye catching election gimmicks. Teachers Cara Biseker and Isla Gaze had successfully inspired their pupils and had cunningly influenced their pupils to promote a pay rise for teachers in their manifestos. I'm looking forward to Primary Seven visiting Westminster in November. I'm sure they'll love it.